Tanzanite is rarer than Diamond and found only in the hills of Merelani in northern Tanzania. This blue variety of zoisite was named for Tanzania, the country where it was found, by Tiffany & Co. The vibrant colour with hues of bluish purple or the more favored pure blue or violetish blue perform beautifully, especially when designed into a stunning piece. Marc has designed numerous pieces using and incorporating Tanzanite from Dress rings to engagements rings, pendants and bangles. It is a stunning gem stone to work with and is always popular with the team at Martinovich. 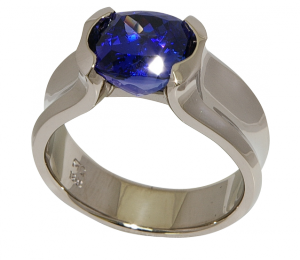 Marc designed Donna’s ring reflecting her love of coloured gems, using a 4.55ct Tanzanite.